I grow apples in my backyard. I am a freelance iOS, watchOS and tvOS developer based in Auckland 🇳🇿. I help companies build amazing apps. I can help you with any stage of the app development, from designing the interface language, to publishing full-fledged applications. I write code that is testable, easy to understand and maintainable. You can check out some of my Open Source work or take a look at my entire work history on LinkedIn. You can also follow me on Twitter. If you think we should make great apps together, you can hire me! actiTENS is a discreet, ergonomic and connected new-generation transcutaneous electrical nerve stimulator (TENS). the smartphone app, acting as an interface between the user and the pulse generator. I started working with Sublimed in late 2015 and helped them get the project off the ground. Over the course of two years, I had the pleasure to design, build and ship the app on both iOS and Android. Abjapp is an iPhone application —iPad update coming soon—, teaching people the Arabic alphabet. The Arabic alphabet contains 28 letters. Each lesson focuses on three specific letters and must be validated by a quiz to progress. Knowledge can also be practiced on-demand, with random quizzes. Abjapp offers details about each letter: its name, how to pronounce it and how to write it, depending on its position within a word. Once unlocked, information about each letter can be found in their respective cards. Young children often have trouble grasping the amount of time remaining between today and long-awaited events. How Many Sleeps? lets children learn about the concept of time, by counting the number of sleeps remaining until an event. I joined the team behind Genetrainer, and created a muscle selection module. This module allows athletes to attach comments to muscle groups and joints. Trainers and physical therapists can then set the goals accordingly. 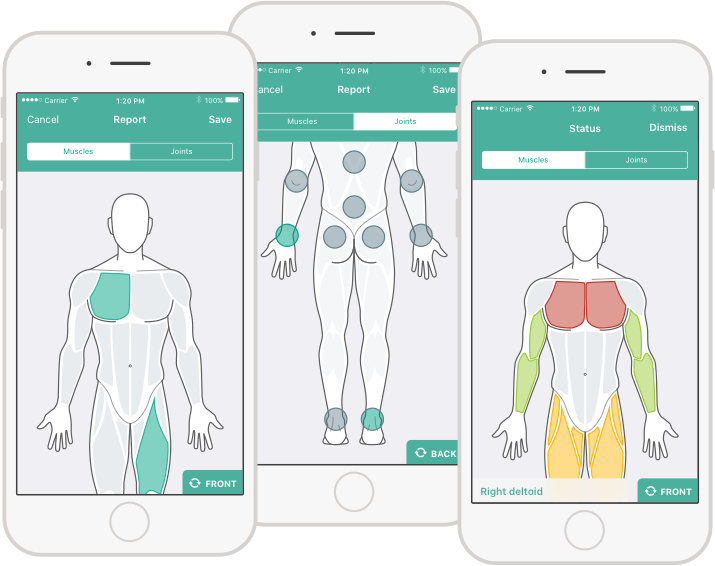 The module can also display the fatigue associated with each muscle / joint after a training session was completed; and be used in a web-centric environment. Although small in scope, this project was immensely enriching, as it let me practice my modest design/illustration skills. Join inspiring private events in small groups. Mynöx is a niche social network focusing on private events. 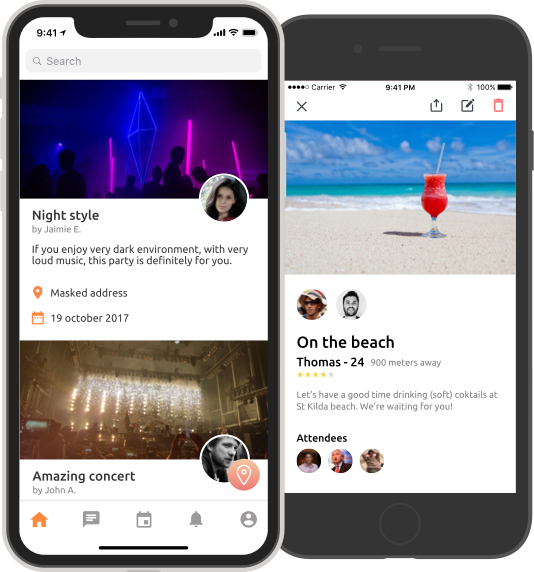 Using the app, a host organises an event at his place and can invite a number of guests (either friends or strangers). a fully-featured notification center, in which users will receive messages about join requests, invitations or event updates. a Facebook Integration, to find and invite friends. From a design perspective, I simply iterated over the previous —Material Design based— mockups that the client provided and adapted them to the iOS design language. Instructions is an open source iOS library, written in Swift, designed to display coach marks. It's easy to use and highly customizable. The library was extracted from previous work, ported to Swift and further improved, to make it available for everyone. ink, a narrative language developped by inkle Ltd.
Inkjs is an open source project created and maintained by @y-loshe. I'm a regular contributor to the project, which closely track the state of the original C# library. Destined to be used within Visual Studio Code, Ink Language Server gave me the opportunity to build both a language server and a VS Code extension. It's far from completed, though. A grammar bringing advanced syntax highlighting in any editor supporting Textmate grammars. Daz Studio, a 3D scene creation and rendering application developped by Daz Productions, Inc.
Autodazzler is a script written in ECMAScript 5, designed to automate the rendering pipeline of Daz Studio. Sophisticate supports different modification rules, and can also run SVGO to further clean SVGs. Given how often I work with SVG, this little utility is a huge time saver. Pomme Plate is a collection of Apple devices, rendered in a flat style. The project is licensed under the CC0 license, making it available to everyone for free. From time to time, I enjoy sharing my experience about programming. I mostly talk at my local CocoaHeads community. Want to work with me, have questions about my work or just want to say hi? Send me an email or use the contact form below!